In celebration of Game of Thrones' eighth and final season, Oreo is releasing a limited-edition cookie line inspired by the hit HBO show. 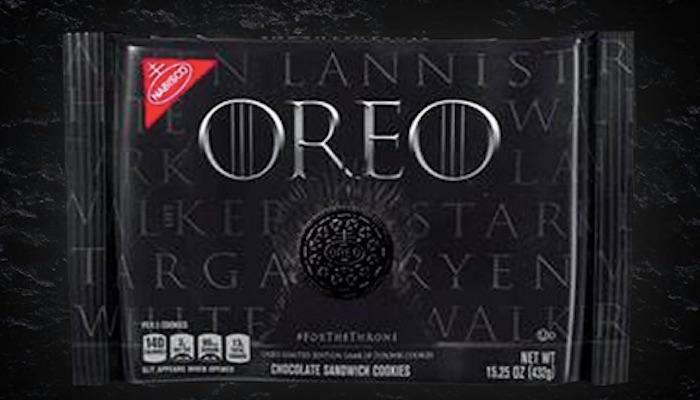 If you're looking for some comfort food as the final season of Game of Thrones gets closer and closer, look no further than Oreo's new line, which is inspired by the HBO fantasy series. Announced on Oreo's Instagram and on popular candy site TheJunkFoodAisle's Instagram (below), the limited-edition cookies will be redesigned and come in special packaging, which depicts an Oreo on the Iron Throne with each of the great house names written in the background. This collab looks to be part of the show's continued #ForTheThrone campaign, as they've already teamed up with Bud Light for a Super Bowl commercial. When the Thrones-inspired Oreos will be available has yet to be announced. But, we're hoping it'll be before the season premiere on April 14. The cookie company has, however, been fairly vocal that these Game of Thrones Oreos won't be exclusively sold, meaning that fans all across the country should be able to get their hands on them. This isn't the first time the HBO show has partnered up with food and drink companies. Last year, Game of Thrones joined forces with Johnnie Walker to produce an exclusive "White Walker" whisky. What do you think? Are YOU ready for Game of Thrones to end? Share your theories with us in the comments below.